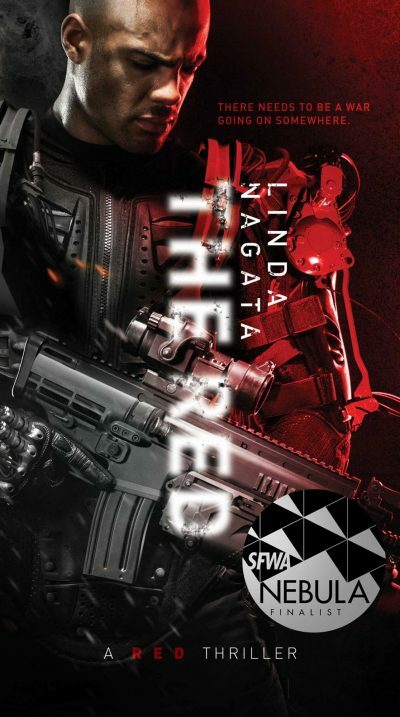 Linda Nagata’s Nebula-nominated The Red: First Light is the first volume in Linda Nagata’s Red Trilogy. At first glance, life in Nagata’s near-future seems pretty sweet. Many of the civil liberties that have long been such an onerous burden to hard-working Americans have been set aside, allowing them to focus on more important matters. Lieutenant James Shelley is a fine example: in another life he might have wasted his life as a political activist, agitating against wars and other profitable activities. In this life, his first attempt at political activism prompted a firm response from the government that stands in loco parentis over all its subjects. One plea bargain later and Shelly became a hard-working member of America’s military forces serving overseas. If that wasn’t wonderful enough, the same advances in neurological interfaces that allow Shelley and his fellow soldiers to function as a Linked Combat Squad allow his minders to keep an eye on what he is doing, or even feeling, pretty much 24/7. There is, however, one glitch in the program. One of the voices in Shelley’s head isn’t listed anywhere in the US Army’s table of organization. Shelley has a reputation for well-timed hunches, hunches that keep him and his fellow soldiers alive (if not always in one piece). When Shelley’s superiors investigate his hunches, they arrive at an explanation, but not one that makes them happy: someone has subverted Shelley’s implanted enhancements and is using them to send Shelley messages of which he is not consciously aware. Did I say “someone”? I should have said “something”; humans have long since lost the ability to keep track of all the code living out in the Cloud. It seems one particular bit of conjectural software, tagged “the Red,” may or may not be intelligent but it certainly has goals, the ability to plan, and the means to carry out its plans. James Shelley is an important chess piece on the Red’s game board, but by no means the only one. Without in any way wanting to russ this novel, it’s weird how much it made me think of Bester’s “Something Up There Likes Me” as it might have read had it been written by Joe Haldeman. Which I bet is really really helpful to all of you not old enough to remember station wagons with wooden paneling. The Red invites favourable comparison to classics like Haldeman’s The Forever War  and Heinlein’s Starship Troopers. Like the two older books, The Red features futuristic soldiers equipped with advanced technology. Unlike the previous two, Nagata seems to have given her technology some thought, with the result that her futuristic military technology is what we in the business call “more plausible” than the gear in Haldeman and Heinlein books. Nagata’s military exoskeletons, the so-called “dead sisters,” provide their wearers with enhanced strength and speed, but they don’t confer anything like the near-invulnerability, godlike armament or magical mobility Heinlein’s mobile Infantry enjoys. I did wonder that military robots and RPVs didn’t play a larger role; soldiers like Shelley are said to be a cheaper alternative to robots, but I am not sure that’s particularly believable. Also, while the communications networks are thoroughly compromised, making RPVs a risky option, the brass don’t know that at the beginning of the book. Of course, machines replacing people is the less dramatic choice. Nagata shores up this choice with an in-book reason for the standard operating procedure. so … while I did wonder at this, there are powerful forces at work encouraging the ratings-friendly approach. Similarly, Nagata eschews the standard approach to dystopia. Her America is arguably less free than the current one. but it’s not that there’s been a dramatic phase change. Rather, the frog is now swimming in water that, over time, has become warmer. I did quibble with the tactics that the main antagonist adopts in their effort to deal with the Red. Said tactics seemed needlessly dramatic and likely to result in congressional investigations of the sort that can go horribly off-mission. The same goals could have been accomplished … well, subtly is probably out of the question, but less unsubtly, at least? Although… I bet the ratings were great. And ratings are a major part of what’s going on. I’ve been collecting Nagata’s books since her 1995 debut, with the exception of the books published by Mythic Island Press. Those were being published when my employers told me what to read … and they were not all that interested in small press output. After reading The Red: First Light; I realize that it was a mistake not to make the extra little bit of effort to acquire her Mythic Island Press books . First published in 2013 by Nagata’s own Mythic Island Press, The Red: First Light is currently available from Saga Press, Simon and Schuster’s new fantasy and science fiction imprint . 1: Also Haldeman’s somewhat less than classic Forever Peace. The Red is much more interesting than Forever Peace. 3: An interesting development, given that S&S already had a distribution relationship with an existing F&SF line. One can only speculate why S&S might find Baen Books insufficient for their needs.